“Massachusetts students who are college and career ready will demonstrate the knowledge, skills and abilities that are necessary to successfully complete entry-level, credit-bearing college courses, participate in certificate or workplace training programs, and enter economically viable career pathways. In order to meet this goal, the Commonwealth has defined a set of learning competencies, intellectual capacities and experiences essential for all students to become lifelong learners; positive contributors to their families, workplaces and communities; and successfully engaged citizens of a global 21st century. Beyond achieving college and career ready levels of competence in English Language Arts/Literacy and Mathematics, all high school students should develop a foundation in the academic disciplines identified in the MassCore course of study: (1) build competencies for workplace readiness as articulated in the Integrating College and Career Task Force Report, and (2) focus on applying academic strategies to problem solving in diverse professional and life contexts, appropriate to individual student goals. Massachusetts will use its 2011 curriculum frameworks, which include the Common Core State Standards, as the basis for an educational program that provides students with the academic knowledge, skills and experience. The ability to direct and evaluate their own learning, be aware of resources available to support their learning, and have the confidence to access these resources when needed. Massachusetts allows students to earn dual credit through dual- enrollment coursework. It is unclear if state law requires public postsecondary institutions to accept these credits (Education Commission of the States, 2015). A list of participating campuses can be found at the Massachusetts Department of Higher Education website. Six districts were awarded funds to launch science, technology, engineering, and mathematics (STEM) Early College High Schools (ECHS). More information about STEM ECHS in Massachusetts, including a list of each school receiving an award, is available at the Massachusetts Department of Elementary & Secondary Education website. In addition to the STEM ECHS noted above, the Gateway to College National Network partnered with several institutions of higher education to provide five Early College High Schools as part of the Early College High School Initiative (ECHSI). More information about schools participating in ECHSI is available at the ECHSI website (Jobs for the Future, n.d.). 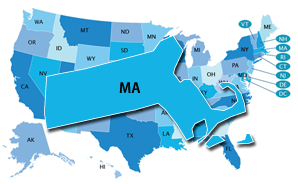 Massachusetts does not have a statewide system for career exploration or career plans at the K–12 level. Massachusetts’ state-specific Early Warning System is called the Early Warning Indicator System (EWIS). Early Warning System data are reported at the student, school, and district levels to teachers and administrators.